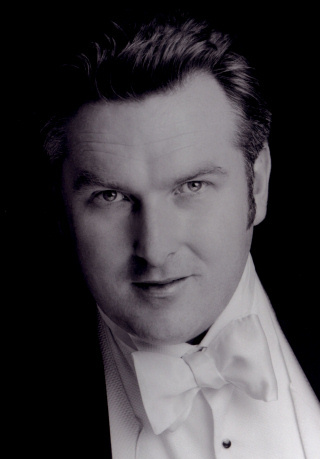 Simon O’Neill, born in New Zealand 37 years ago, has had a meteoric rise to becoming one of opera’s finest Heldentenors. The list of conductors he has worked with is remarkable for someone whose career is only in its early years; Levine, Muti, Pappano, Barenboim and Runnicles are just a very few of a roster of familiar names. I met him during rehearsals for two performances of Lohengrin at Covent Garden that will see him perform this role for the first time on stage. Simon O’Neill contributes to the podcast on the Royal Opera House website about the opera and humorously distils the essence of the story at the start of Act III as Elsa asking Lohengrin ‘Dude, what’s your name?’ As our conversation developed I found that this remark was typical of this self-deprecating but confident and intelligent singer. He has his feet firmly on the ground and is looking forward to the many challenges ahead as his career progresses. I asked first about that podcast. I was told ‘Simon try to be casual’ but when I saw it I thought perhaps it was a bit too casual. I lived in New York too long and that is where all those things come in but it was nice to be given the opportunity to do the podcast. I hope I haven’t put too many people off but that’s the story – it’s about a swan, a guy, a question, a woman and that’s it. I wondered how he approached such a demanding role. In my humble opinion Lohengrin is all about passaggio and all about singing Mozart’s ‘Dies Bildnis ist bezaubernd schön’ before you go on stage. The hard bit is the start ‘Mein lieber Schwan’ and then there is the dramatic stuff where if you turn up the metal a bit too much you’ll pay for it by the middle of the third Act. This is my first one and it is an honour that my first proper performance will be at the Royal Opera House, though this was the same with Florestan and Siegmund, my other important ones here. For me it’s about stamina, discipline and fitness for singing and then remembering all the words because that is a fault of mine as I don’t speak German fluently yet - because that’s just how my career has developed and I’ve never had the chance to go to Germany and sing. I need to remember how many people I’m speaking to and how formal it is. Lohengrin is not a role I could sing if I was sick though there are many roles I could. We have heaps of back-up here at Covent Garden because we have three Lohengrins – Johan Botha who is doing most of the performances and who I am a massive fan of, and the great Klaus Florian Vogt who is here to sing in Lulu. Simon O’Neill’s current teacher is the legendary Wagnerian bass-baritone Sir Donald McIntyre so I asked about him and the importance of this association to his career. I’ve been very lucky throughout my life with my singing teachers, mainly these have been women and Sir Don is my first male teacher. In 2001 I turned up on his doorstep in Kent and said ‘I’m a fellow New Zealander and I’d like to sing some opera for you’ and I haven’t looked back. It is impossible to put into words how that man has helped me. Actually he has made my career by instilling in me the discipline he learnt from Reginald Goodall and his Sadler’s Wells days and throughout his distinguished career. He is a very hard taskmaster to the point that between the first two Acts of Die Walküre here at Covent Garden he was in my dressing room giving me advice. I love that. The man is incredible. For me now in this Lohengrin – and not only as a New Zealander – an important factor is that Sir Don was the first Telramund in this production 32 years ago. He was a great Telramund and has a wonderful story about how he got to first sing it in Bayreuth in 1967. He turned up to audition for the smaller role of the Herald and sang the Telramund aria and Wolfgang Wagner said ‘You sang it so well I am going to punish you and give you Telramund instead’ - and that is the true story how Sir Don’s illustrious Bayreuth career began. Sir Don is such a great man. It is a privilege to be able to spend time with him and try to get some of that knowledge that comes from Reginald Goodall, as well as learning from the others I work with, such as David Syrus, Anthony Negus and Lionel Friend who surrounded that legendary conductor. Coming from New Zealand and with his career developing on all continents I asked how much he enjoyed flying to and fro. I don’t mind and it is something you have to get used to if you want to be an opera singer these days. Sir Don is my mentor but Plácido Domingo is like a god to me, the way he does things and has had such a wonderful career, and he said to me once ‘Simon, whenever I see an airport I start going sleepy’. For me all I need to think is that New Zealand is only a day on the plane. My wife and I have a house in New Zealand but we also have an apartment in Clerkenwell and are here a lot of the time. My wife is a partner in a City law firm and is a very successful lawyer in her own right. It’s great to have someone with a real job when you are an opera singer (laughs). We’ve just had two new babies, twins, Siegmund and Sieglinde – no, we didn’t actually call them that (laughs again). They are only 5½ months old and they are with their mother in New Zealand. I miss them very much but it has been good to be here on my own because I have a lot of work to do with Lohengrin. I go home and study the score then go to sleep; I get up, study the score and then rehearse it. When finished I study the score some more. Singing Parsifal was easy compared to this and it is the hardest thing I’ve every done in my life. Just think - when I grow up I’ve still got a couple of Siegfrieds to learn (more laughter). I wondered what he remembered about his first Parsifal in 2005 with Anthony Negus at the New Zealand International Festival. Well it was a piece of New Zealand history to have Parsifal put on there and it was good to be part of it. Sir Don was in it with me, his protégé, and there were a few other singers from New Zealand he had helped train. They took a chance on me but the performance was a great success and Anthony was phenomenal. I’m hopeful that might get turned into a recording someday. Someone who features prominently in the list of famous conductors that Simon has already worked with is Daniel Barenboim and I wondered if there was anything he could say about him. Well I know that I was in Australia just a couple of weeks ago while he was doing Lohengrin in Berlin and my phone rings and it was Daniel Barenboim himself saying ‘Simon you have to come to Berlin’. I was four hours north of Adelaide and out towards the desert and had to say ‘Maestro I can’t, I’m in the middle of Australia’. I don’t know what’s happening lately I’ve been so spoiled because it is amazing how things happened. Mr Pappano here at Covent Garden has been incredibly generous to me, the whole opera house has, and of course it was through him I was introduced to Mr Barenboim and got to sing for him. Plácido does too and I became number two to him which is a great thing and now when Plácido is too busy he tells Mr Barenboim ‘Simon can do it’. Isn’t that amazing! I did Die Walküre last year with Mr Barenboim’s West-Eastern Divan Orchestra and he said to me that this orchestra might be the greatest thing he has ever done. It was wonderful to be in rehearsals with these kids. I say ‘kids’ but some are my age. On the seventh first violin desk you have a young Jewish man who is in his early 30s and is the leader of the Berlin Philharmonic Orchestra and sitting next to him is a 10-year-old Palestinian from Ramallah who has been playing the violin for only three years. Then there are amazing people from Egypt. The political side is so strong but you get past that and you’re in there to make music and they are not kids anymore but proper musicians. This year I am singing Florestan with them and the tour includes visits to the Proms and the Salzburg Festival. When Mr Barenboim or Mr Pappano call and say ‘Simon we want you to do this’ I reply ‘Who’s sick – who else have you called?’ (laughs). Joking apart, I asked him if it was difficult to realise how far he had come in such a short time. Well it nearly didn’t happen for me. My first success in this phase of my career was in the UK Wagner Bayreuth Bursary in 2001, I’d just learnt a couple of arias but they thought I had potential and by winning it I could put something on my resumé. To make a career is so hard and so difficult but there are many ways to do it. The prize I won included the opportunity to go to the Bayreuth Festival but I wasn’t able to go and was very upset about that. Instead Ken Noda, James Levine’s assistant at The Met, said ‘Simon we are going to do a recital together of Janáček’s The Diary of One Who Vanished’. I sang this for Ken Noda - who is another genius - and he goes back to Mr Levine; the Met then auditions me for the First Armed Man in Die Zauberflöte and although Mr Levine wasn’t there, all the important others were and I sang some Mozart for them. As I was leaving Ken Noda said ‘Oh Simon you brought a bit of Siegmund didn’t you?’ He played it and I’d gone into the audition for the First Armed Man and they gave me the cover of Plácido Domingo and Ben Heppner for Siegmund and Lohengrin. From that I got upgraded to sing Siegmund at the Met last year – a software upgrade I call it – and I will be singing in the new Ring Cycle. This all stemmed from not going to Bayreuth. I was talking to Johan Botha and he said there are only a few of us doing these roles now. It took me a few moments for me to realise that he had included me in the same sentence as him. He named five people and it was an incredible honour to be on this list – I might get used to this but I hope not. I’m in the obviously small pool of International Heldentenors but I’m in with the ‘big boys’ and that is new to me. The conductors I sing for demand their level and I’m trying my hardest. Obviously it has been a massive learning curve and a quick one for me because since I started singing the German repertoire, I think I am singing far better. I still loving singing Rodolfo, Alfredo, Pinkerton and Cavaradossi but I’m not getting those sorts of contracts. I’m getting all the big German ones and that’s fine because it suits me to do these. Of course if I jump in too big I’ll hurt myself with Tristan and Tannhäuser and the Siegfrieds but there’s time and my voice has height. I don’t know if people would particularly want to hear me sing Tristan – I don’t think I would (laughs). I have to pinch myself when I think of my calendar that’s pretty full with major engagements in some pretty exciting places until 2014. It’s incredible but comforting obviously. Now I am learning Walther von Stolzing with Sir Don, Lionel Friend and David Syrus as that is my next new Wagner role here. But I do need some more of those Italian things because my voice needs to have flexibility and in particular I’m hoping to do my first Otello soon. I wondered whether he had always wanted to be a singer and how he had come to study in New York. I never wanted to be anything else since I was very young. No others in the family are professional musicians, my mum is a school teacher and my father is a farmer, yet my two brothers and I all did music though I was the only one to take it to a professional level. I started the singing in my late teens and auditioned for University but they said I was a rubbish singer but because I was a good Tuba player I could study that there. I could also play the piano and did a lot of répétiteur work at the school playing for other singers. I continued to have singing lessons and became a young baritone with potential in New Zealand and did well in competitions. My big teacher there was another New Zealander, Frances Wilson, and she took me to New York in the mid-1990s and I never looked back from there. I was there for nearly ten years and studied at the Juilliard with Marlena Malas a very famous teacher. I was a baritone until I was 24 and did a few professional roles as a baritone in New Zealand so I still have a little bit of baritone in the voice which has been great for my new Fach. To develop the height to the voice has been the big thing for the last six or seven years and latterly that has come in. I got some of my best career advice in New York from Marilyn Horne who told me ‘Simon, to make a career you need to surround yourself with your “Board of Governors” – and they can’t be “yes-men” ’. So you need amongst others your teacher, your partner and your manager. I have an incredible group of people around me to help me sing as well as I can and not mess up my career. Apart from those he had already mentioned, I asked if there are other singers whose voices he admires. Yes I watch and learn from people like Botha and Heppner but my favourite out of all the Heldentenors is Max Lorenz - how he dealt with the range is so perfect. Then there is James King and all the singers he taught. Ultimately for me when I am singing Lohengrin though – even though he didn’t sing it himself – Fritz Wunderlich always goes through my head as that is the sort of purity and discipline I’m aiming for. I don’t have the rich bronzy sound of Melchior for example, as my voice is more of a higher silvery sound. It might hopefully go that way as I get older but for me now it is Lorenz or Helge Roswaenge or Franz Volker of the famous 1936 Bayreuth Lohengrin that I look to. Like that Bayreuth performance we are opening up all the cuts and doing all the extra bits that have never been done here before. This came as a surprise to me and although I had a complete recording on CD conducted by Barenboim and knew there was a new recording of the full version due to be released soon conducted by Semyon Bychkov, the conductor of these Covent Garden performances, I had been unaware that these forthcoming performances would be ‘complete’. I wondered how this affected him. Well we are doing the two verses of ‘In fernem Land’ and open up a cut afterwards. Wagner himself cut a lot of it because he thought it went on too long but it’s new and these days people love to hear these bits that have been shelved. After ‘I’m Lohengrin’ it goes back a bit and – forgive the vernacular – we start ‘Oh by the way we’re up there in Monsalvat and the Grail’s there and in the distance we see a swan’ and he talks about this and the swan goes ‘Hey Dude that’s all I’m here for’ and there is more talk about that. So it is basically fleshing out the back-story but musically it is very beautiful. I must be very careful because after you sing ‘In fernem Land’ properly and with the right shine the voice is very high afterwards. It needs that metal, that silver in your voice to get those As – only As – but As are high for a heldentenor when you have sung in mid-range for a lot of the time. You need to be conscious of the extra stuff you now have to sing and of course it has also meant a lot of extra study. I asked whether Elijah Moshinsky had been along to rehearsals for this revival. Yes, he has turned up for some rehearsals but he has of course got his Il trovatore on at the same time. It’s 32 years old but still a wonderful production. I’ve tried to look at all the swords and find where all the words are written on them but I can’t find anything as they must have been cleaned (laughs). While Mr Moshinsky has been busy we have been so spoiled by his assistant Andrew Sinclair who has put it all together. We have the lovely Edith Haller as Elsa who is making her debut here. We had our own debut together at the Salzburg Festival in 2006 when she was First Lady in Die Zauberflöte and I was the First Armed Man with Muti. We met again at rehearsals for this and realised how far we had come. There is Johan of course and Falk Struckmann and Gerd Grochowski as Telramund. There is Kwangchul Youn as King Henry and Petra Lang as Ortrud. This opera house – I might humbly say – has got itself essentially two casts of the top level. Not forgetting Maestro Bychkov who is so great, another genius, although terrifying - but I’m usually like that with conductors anyway. I wondered what he was looking forward to most in the near future. Also I’ll soon be recording my first CD beginning late in August. I’ve been chasing EMI for ages like any young singer does and they finally came to my Ring Cycle when I sang Siegmund here and they agreed we should do one. It will be lovely and will be called ‘Father and Son’ or something similar like that and will have all my favourite tunes from the Wagner roles of Parsifal, Lohengrin, Siegmund and Siegfried. It will be an honour to be with that prestigious label. Another good thing is that the New Zealand Symphony Orchestra has become an EMI orchestra as well so we’ll be able to record this with them and I am delighted about that. Simon O’Neill talked to me over lunch after his morning rehearsal and before a full run through of Act III during the afternoon, and our time seemed over all too quickly. He talked with great honesty and much good humour about his developing career and revealed a wonderful level-headedness with his thoughts about his future. My mind went full-circle to the podcast and his ‘Dude, what’s your name?’ comment. His name is Simon O’Neill and it’s definitely one to watch out for soon in the great opera centres of the world; Covent Garden,The Met, San Francisco, La Scala, Berlin, Vienna, Salzburg and Bayreuth to name just a few of them where he will be performing in coming years. For more details about Simon O’Neill’s forthcoming performances please visit his website (http://www.simononeill.com/). Simon O’Neill will be singing the role of Lohengrin at two forthcoming performances at Covent Garden on 5 and 16 May – for further details please see the Royal Opera House website ( http://www.roh.org.uk/).